Myron Mixon is without doubt the biggest name in BBQ. He is a three time World BBQ Champion and the chief host of TV’s BBQ Pitmasters. It is therefore no surprise that I, like many countless thousands of others bought his book ‘Smokin’ with Myron Mixon‘. One of my favourite things to cook is beef short ribs and so naturally I went straight to his recipe – I had to see how it was different to my own. Now I’m pretty proud of my shorties: I managed to pull a 4th place at last year’s Burleigh BBQ Competition, the 2nd biggest BBQ competition in the southern hemisphere. However, it was when I started to read Myron Mixon’s recipe that things got really interesting. The biggest thing that struck me was the difference in cooking times. Myron’s method prescribes a total of 4 hours and 15 minutes at 275F (135C). I’ve had some absolute disasters working out my own method for cooking shorties, and I mean bad. The first time the ribs were so fatty that they made my wife and I physically ill and I swore I’d never cook them again. However, I’m a sucker for a challenge and I had a few more goes until I hit the formula of 275F until the ribs hit an internal temperature of 203F. Experience taught me that this takes 10 hours on average. This is a lot more than four and a quarter hours. The Winningest Man in Barbecue has to be on to something though and so I decided to run an experiment comparing Myron’s recipes and methods to my own. Then I got struck with a lightning bolt of genius – I had friends coming around to celebrate Australia Day. I explained to them what I wanted to do and ‘The Great Australia Day Rib-Off’ was born. The first thing I had to do was prepare the rub. This is a really straightforward process but is the start of where I had to make some substitutions. Firstly I didn’t have kosher salt so I used pink Himalayan rock salt. I also didn’t have any chili powder so I used some of my homemade smoked chili powder. The rub was so tasty I could have eaten it with a spoon. I trimmed up Myron’s ribs per the instructions, applied the rubs to the ribs and put them in the fridge overnight. This is my spice rub recipe. Myron Mixon vs Me Part 2: 'Q Time! Early in the morning, I got up, lit my oldest and dearest Weber and put my ribs on with apple wood chunks, knowing that it was going to be an all-day cook. 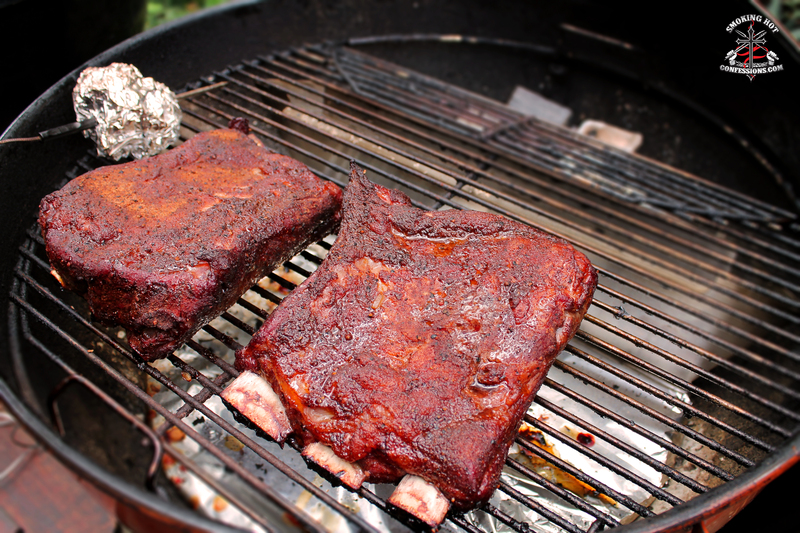 I also used the opportunity to try out my new Grilla’Que so I could write a review of it. Every hour I cracked the lid and spritzed them with a 50/50 mix of apple juice and organic apple cider vinegar. Myron Mixon vs Me Part 3: Time to get Sauced! While my ribs were working on their head start, it was time to start putting together the sauces for the Rib-Off. I love to use a spicy apple BBQ sauce whereas Myron Mixon’s recipe calls for his Tangy Sweet Sauce. Once again, I had to make some substitutions. To start with, I didn’t have any Jack’s Old South Vinegar Sauce so I had to make some of his Basic Vinegar Sauce from scratch. Firstly I had to use tomato sauce instead of ketchup. I’ve bought both ketchup and tomato sauce from the store in the past and can’t tell the difference between the two. I’ve found a lot of American sources refer to tomato sauce as a Bolognese-like sauce. Australian tomato sauce is definitely not like this. Secondly, we don’t really have a generic ‘hot sauce’ so I had to improvise. After doing some research I figured the closest thing I could get my hands on was Sriracha Sauce. With the vinegar sauce made I then had to make the the Tangy Sweet Sauce. I couldn’t get a hold of any corn syrup so I substituted it for Golden Syrup and I could get any peach preserves so I had to use peaches and mango in syrup. It was now that I put Myron’s ribs on. 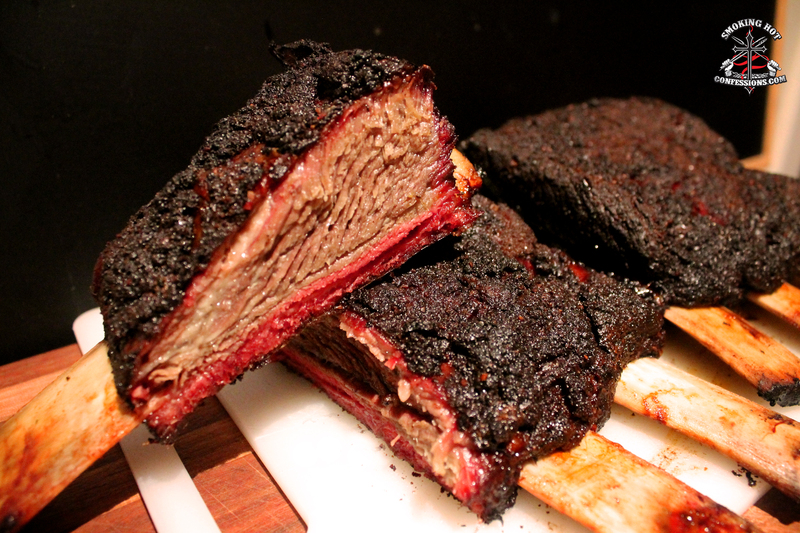 My beloved OTG was at 275F just like the first one and the ribs were also smoked using apple wood chunks. Here, I made a mistake. The recipe calls for the ribs to be cooked in a pan for the first two hours. I forgot about this part and didn’t do it. However I did put the pan in at the two hour mark when the recipe called for water to be added. At the 4 hour mark I basted the ribs with the sauce and returned the pan with the ribs to the ‘Q for another fifteen minutes. The finished product is what you see in the photo above. The bark and the sauce was delicious and I really liked the fruity overtones of the sauce in particular. I loved the colour too. The smoke ring clearly was pretty good and the pull-back on the bone was excellent. However what I found was that the meat was quite tough: the connective tissues hadn’t melted away and the fat hadn’t rendered as you can see in the middle of the photo above. Sadly the guests weren’t overly impressed and most of this lot ended up in zip-lock bags in the freezer to be recycled into something else later (stay tuned for my Rib Stew Recipe!). Ten hours for bliss? Deal! It wasn’t too much longer that my ribs were ready. I don’t sauce my ribs so the bark was out of this world. The smoke ring was incredible. More importantly, the fat was all rendered off and the connective tissues dissolved. The sharp knife slid through them like butter and not one person touched my sauce, which was both gratifying and annoying as I’d spent an hour and a half making it! The common court unanimously agreed that my ribs were the winner. Myron Mixon vs Me Part 6: The Point? But how can this be? Myron Mixon has been competing and winning BBQ competitions since I was still in high school. There must be a lesson to be learned here. What it comes down to is regional variance. I didn’t have access to a few herbs, spices and sauces that the recipe called for which would have made a difference. Then there’s the meat: the ribs that would have been available to me would have been undoubtedly different to the ribs available in the States. You may think that a rib is a rib, but one thing I learned when I visited the US is that a steak is not a steak. This difference in cuts would most definitely affect the cooking times for a start: we grill a steak, but we don’t grill a brisket. What does this mean for us Average Joes? We need to get out on OUR grill and cook OUR meats using OUR ingredients. Again and again and again. Most definitely you should use the recipes of the pros as a guide – the accumulated knowledge in these books is incalculable, but realise that the more you cook, the better your cooking will be. Once you’ve learned how your ‘Q handles ingredients available in your area, you’ll be unstoppable. In any case, my friends and I learned a lot from this little experiment and had a hell of a lot of fun doing it. And that’s what barbecue is all about. I ordered one of your cook books , had it sent to my nephew for his birthday and he has never received it. I have no other way of contacting you so I’m trying this. I don’t actually have a cook book out now. Are you sure you ordered it from here? You can always contact me directly with an email to [email protected], or I have a Contact Form you can fill in on the ‘Contact Me’ page which you can access from the top of the page.